As the central feature of the face, the nose has a profound effect on facial aesthetic values. Perhaps more than any other aspect of nasal aesthetics, the nasal dorsum determines the character of the nose. As stated by Lupo, "The profile, above all, is of special fascination, since it is the aspect of ourselves we never actually see." In addition to the height and configuration of the nasal dorsum, the projection of the nasal tip affects the nasal profile, and the contribution of both of these factors must be considered. Modern concepts of nasal aesthetic values have their roots in ancient Egypt and Greece. Indeed, the first known descriptions of nasal deformities and therapies date to the Egyptian papyrus. Early descriptions of nasal and facial characteristics date to the 1600s, and the dorsal profile of the nose figures prominently in these classification schemes. In 1845, Dieffenbach performed the first operation to alter nasal shape through external skin incisions. A lack of adequate anesthesia was a major limitation of early rhinoplasty. However, the discovery of cocaine in 1884 revolutionized the development of aesthetic rhinoplasty. The first aesthetic rhinoplasty is attributed to Roe in 1887. However, Joseph pioneered much of the early development of aesthetic rhinoplasty, including techniques and instrumentation. Dorsal hump excision has been an integral part of aesthetic rhinoplasty surgery from its inception. The techniques and instrumentation of the early practitioners of rhinoplasty have been refined and advanced over time. 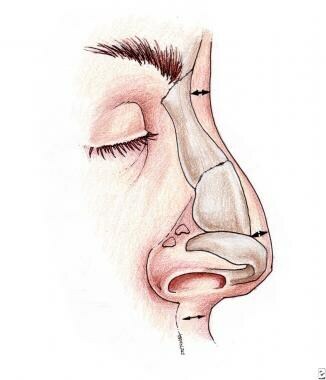 However, the principles involved in dorsal hump reduction remain very similar to those of early nasal surgeons. A dorsal hump can detract from overall nasal and facial aesthetics, particularly because of the central prominence of the nose in relation to other facial features. In men, the dorsum should ideally be straight or slightly convex to preserve a strong and masculine dorsal profile. In women, the nasal dorsum should be relatively straight with a supratip break and a nasal tip that projects 1-2 mm above the nasal dorsum. When a dorsal nasal prominence is considered, the contribution of the depth of the nasofrontal angle and the projection of the nasal tip must also be taken into account. When a prominent osseocartilaginous vault is assessed, the forehead and the nasofrontal angle, in particular, should also be considered. 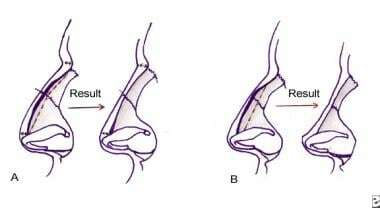 The root of the nose should begin at approximately the level of the supratarsal crease with a nasofrontal angle of 115-130° (ideal angle, 120°). The nasofrontal angle is measured by drawing a line tangent to the glabella through the nasion, which intersects a line tangent to the nasal dorsum. Any dorsal hump should be transected by the nasal dorsal line to prevent distortion of the angle. An angle that is too deep accentuates whatever dorsal prominence is present and makes the hump appear larger. Lowering the hump to the level of the nasofrontal angle may result in excessive dorsal resection. Frequently, a combination of nasofrontal angle augmentation and conservative dorsal hump resection results in a smooth dorsal profile. The dorsal line (nasion-tip) should form a 30-40° nasofacial angle with the facial plane (glabella-pogonion). Tip projection can also be assessed by various methods. The variable skin thickness overlying the nasal dorsum should also be considered. The skin–soft tissue envelope tends to be thinnest overlying the rhinion, and straight-line resection of the dorsal prominence can result in a scooped-out appearance or a polly beak appearance in the supratip area. Overreduction of a man's nasal dorsum can feminize the patient's appearance and should be avoided. Genetics is the predominant factor affecting growth of the nasal dorsum and nasal hump development. However, either birth trauma or trauma later in life has also been implicated in the development of a prominent dorsal convexity. Childhood injuries may go undetected until adolescence; therefore, a definitive antecedent traumatic episode may not always be elicited. In the initial few months of life, the nose grows rapidly. This growth subsequently slows until puberty when a second peak in nasal growth occurs, during which early nasal trauma may become manifest. Because the upper lateral cartilages and nasal septum are a contiguous unit, injury to one area can affect the entire cartilaginous vault and, ultimately, the development of the nasal dorsum. Additionally, if trauma causes collapse of the middle nasal vault or decreased tip projection, the illusion of a dorsal hump may result. In patients presenting for secondary rhinoplasty, a nasal hump may represent inadequate previous resection or polly beak formation. Both the bony and cartilaginous vaults of the nose contribute to a dorsal nasal hump. The paired nasal bones vary in size, shape, and thickness and generally provide the smaller contribution to the dorsal hump. Most of the nasal hump usually lies in the cartilaginous vault of the nose, consisting of the paired upper lateral cartilages and nasal septum. The depth of the nasofrontal angle and the projection of the nasal tip should also be considered in a prominent nasal hump. Any surgical evaluation includes taking a careful history. Specific inquiries into past nasal trauma and symptoms of nasal airway obstruction should be made. If prior nasal trauma has occurred, any differences in nasal appearance or function should be elicited. Preaccident photographs may be useful in this assessment. If a family member accompanies the patient, that person's nasal appearance may provide insight as to whether the nasal hump is inherited. Inquiry can be made regarding whether other family members have a similar dorsal prominence. Occasionally, family traits can carry additional hidden emotional weight. If the family is not supportive of or is resistant to the patient having rhinoplastic surgery, the physician may wish to proceed cautiously. Similar consideration should be given to patients of various ethnicities; their nasal appearance may play a role in their sense of identity and heritage. Nasal hump excision in these patients should generally be conservative, maintaining a strong nasal profile and the ethnic appearance of the nose. However, this should be discussed in detail with the patient to assess their concerns and desires. In addition to a good medical history, any past surgical procedures or history of bleeding or anesthesia problems in the patient or the patient's family members should be noted. Any medications or herbs the patient is taking should be recorded. This information allows the surgeon to assess if any additional preoperative evaluation or testing may be necessary. Past cosmetic or rhinoplasty procedures are of specific interest. In revision rhinoplasty patients, previous operative notes are occasionally beneficial. However, the patient's specific concerns and reasons for seeking surgical revision are more important than past operative notes. The surgeon must assess whether the patient's specific concerns are appropriate and correctable and discuss this in detail with them. In primary or revision rhinoplasty, the patient's expectations must be tempered by what can be realistically achieved. Although preoperative photographs are essential in preoperative planning and for documentation and follow-up, they can also be used to educate the patient as to what is possible and, perhaps more importantly, what is not possible. The nasal bones should be evaluated for symmetry and width. In patients with previous nasal trauma, intermediate osteotomies may be indicated if significant convexity or concavity to a nasal bone is present. The nasal dorsum should be palpated to assess for any irregularities or asymmetries. The quality of the overlying skin should be assessed, particularly because of differences in skin thickness of the nasal dorsum. The relative contribution of the bony and cartilaginous components of the nasal hump can be assessed by palpation. An intranasal examination should be performed to evaluate for any septal deviation, turbinate hypertrophy, or nasal valve narrowing. The nasal tip should be carefully assessed. Dorsal hump excision is an integral part of the rhinoplasty procedure in patients with prominent nasal dorsa. The dorsal hump should always be assessed in relation to the nasofrontal angle and nasal tip projection. The bony pyramid consists of the ascending (frontal) processes of the maxilla and the paired nasal bones. The nasal bones are one half to one third of nasal length. Their thickness varies, with a tendency to be thicker more cephalomedially and thinner inferolaterally. Cephalically, the nasal bones articulate with the nasal process of the frontal bone at the nasofrontal suture. The nasal bones are also fused to the perpendicular plate of the ethmoid. The periosteum overlying the bony pyramid is a strong layer, adherent midline between the nasal bones at the internasal suture line. The anatomy of the bony pyramid is significant in performing osteotomies. Generally, lateral osteotomies are performed low on the maxillary face to prevent a step-off deformity. Therefore, most of the osteotomy is made along the ascending process of the maxilla, curving to involve the nasal bones at the superior extent of the osteotomy. Because the nasal bones are thick and narrow in the region of articulation with the frontal bone, further surgical narrowing of this area is not generally indicated. If carefully preserved, the periosteum can serve as a supportive sling for the nasal bones. The periosteum is elevated sharply in the midline out of the intranasal suture to allow dorsal hump resection without its violation. Laterally, it is elevated only as far as access to the midline bony hump requires. Ideally, the remaining attachments to the nasal bones are left intact to stabilize and support the bony fragments after osteotomies. The lacrimal sac and drainage apparatus are found laterally in the ascending process of the maxilla. Although, theoretically, a misdirected osteotomy could result in lacrimal injury, the thick heavy bone of the lacrimal crest protects the lacrimal structures, and injury rarely occurs. Refinement of the nasofrontal area is occasionally necessary and can be difficult because the skin–soft tissue envelope is thick and may tend to bridge the concavity and blunt the underlying skeletal changes. Guyuron has estimated that approximately 25% of skeletal modifications are visible externally in soft tissue changes. Because of this tendency, overcorrection is necessary in this area. Nasofrontal augmentation is accomplished more easily using autogenous cartilage or alloplastic materials. The presence of a deep nasofrontal angle is best addressed by nasofrontal augmentation combined with conservative hump resection. The bony and cartilaginous vaults of the nose are intimately related. The cephalic margin of the upper lateral cartilages is adherent to the undersurface of the nasal bones for a distance of 7-10 mm. To avoid destabilizing the middle nasal vault, preservation of this attachment is imperative. Middle nasal vault destabilization results in a cosmetic deformity that is difficult to correct and, frequently, airway compromise. The periosteum should be carefully incised directly overlying the nasal bones to prevent inadvertent division of the attachment of the upper lateral cartilages. Also, rasping must be carefully preformed to avoid avulsing this attachment. Orienting the rasping motion in an oblique direction can minimize the risk of detachment. The middle vault of the nose is composed of the upper lateral cartilages and the dorsal septum. The cephalic edge of the upper lateral cartilages firmly adheres to the undersurface of the bony pyramid. Caudally, the upper lateral cartilages are relatively mobile and have varying attachments with the lower lateral cartilages. Although tightly adherent or fused to the dorsal septum cephalically, more caudally the edge of the cartilage may lie more laterally and be only loosely adherent via fibromembranous connections to the septum. Laterally, the upper lateral cartilages have fibrous attachments to the pyriform aperture, and small accessory sesamoid cartilages may be present. The upper lateral cartilages usually form a 10-15° angle with the anterior septal angle. This area comprises the critical internal nasal valve, which accounts for 50% of nasal airway resistance. Commonly, most of the dorsal nasal hump is cartilaginous in nature with a smaller contribution from the bony component. Cartilaginous profile alignment consists of excision of the portion of the dorsal septum and upper lateral cartilages that constitute the dorsal prominence. This portion can be removed in continuity with the contribution from the bony component. The mucoperichondrium, which underlies the upper lateral cartilages and maintains their attachment to the dorsal septum, should be carefully preserved. Separation of the upper lateral cartilages from the septum is indicated for correction of a deviated middle vault or a very large dorsal hump where excision risks violation of the intranasal mucosa. In addressing a bony-cartilaginous hump, the overlying skin–soft tissue envelope should be considered. Unlike the skin of the nasal tip, the skin overlying the upper two thirds of the nose is relatively thin and mobile, containing little subcutaneous fat and sebaceous glands. Nasal skin varies in thickness along the length of the nose. It is thinnest over the rhinion then becomes progressively thicker in the regions of the nasion and supratip. Because of the varying thickness of the nasal skin, a slight skeletal hump should exist at the rhinion to maintain a straight dorsal profile. In addressing a dorsal hump, a straight-line reduction of the nasal skeleton should be avoided because this results in an unacceptable profile. See images below. Because of the varying skin thickness over the nasal dorsum, straight-line hump resection can result in a concave nasal dorsum profile. Rather, the nasal dorsum should be left with a slight convexity at the rhinion where the skin is thinnest, resulting in a straight nasal profile. Overresection must be carefully avoided in the area of the rhinion where the nasal bones are more delicate. The thicker bone more superiorly in the region of the nasofrontal angle must be adequately addressed to produce a smooth dorsal profile. The dorsal hump, if present, can be removed by rasping or with a Rubin osteotome or powered instrumentation in the case of a larger dorsal hump. The dorsal hump must be carefully resected submucosally to avoid communication with the nasal cavity. Narrowing of the nasal dorsum is achieved with osteotomies. If minimal reduction of the nasal dorsum is required and the width of the dorsum is proportional to the nasal base, then no narrowing may be required. Decreasing the dorsal height results in an apparent widening of the nose, because the width of the nose is viewed in relation to its height. Reducing the width of the nose may restore the apparent nasal proportion. Similarly, dorsal augmentation results in an apparent narrowing of the nose. However, whenever significant dorsal reduction has been performed, osteotomies are required to prevent open roof deformities. Lateral osteotomies medialize the lateral nasal walls. Back fracture ideally takes place between the thin and thick areas of the nasal bones. If the fracture takes place through the thicker superior bone, a rocker deformity may result, requiring an additional osteotomy in the appropriate back fracture location. If minimal hump resection has been performed, medial osteotomies may be performed to control the back fracture and alter the position of the nasal bones. Medial osteotomies are directed superolaterally and performed prior to lateral osteotomies. Because rhinoplasty is an elective procedure, significant medical problems that could potentially increase the surgical risk are a relative contraindication. Any history of significant bleeding problems or a family history of bleeding problems warrants a more extensive preoperative evaluation. Any patient taking anticoagulants must be able to stop these medications during the preoperative and postoperative periods. Guyuron B. Nasal osteotomy and airway changes. Plast Reconstr Surg. 1998 Sep. 102(3):856-60; discussion 861-3. [Medline]. Klein D, Hollander L. A new instrument for rhinoplasty: the osteotome with protector and internal guide. Aesthet Surg J. 2012 Mar. 32(3):286-93. [Medline]. Khansa I, Khansa L, Pearson GD. Patient Satisfaction After Rhinoplasty: A Social Media Analysis. Aesthet Surg J. 2015 Jun 10. [Medline]. Constantian MB, Lin CP. Why some patients are unhappy: part 1. Relationship of preoperative nasal deformity to number of operations and a history of abuse or neglect. Plast Reconstr Surg. 2014 Oct. 134 (4):823-35. [Medline]. Whitaker EG, Johnson CM Jr. The Evolution of Open Structure Rhinoplasty. Arch Facial Plast Surg. 2003. 5:291-300. Verwoerd CD, Verwoerd-Verhoef HL. Developmental aspects of the deviated nose. Facial Plast Surg. 1989 Winter. 6(2):95-100. [Medline]. Adamson PA. The over-resected nasal dorsum. Facial Plast Surg Clin North Am. 1995 Nov. 3(4):407-419. Adamson PA, Galli SK. Rhinoplasty approaches: current state of the art. Arch Facial Plast Surg. 2005 Jan-Feb. 7(1):32-7. [Medline]. Anderson JR, Ries WR. Rhinoplasty. Emphasizing the External Approach. NY: Thieme Medical Publishers; 1987. Arslan E, Aksoy A. Upper lateral cartilage-sparing component dorsal hump reduction in primary rhinoplasty. Laryngoscope. 2007 Jun. 117(6):990-6. [Medline]. Becker DG, Toriumi DM, Gross CW, et al. Powered instrumentation for dorsal reduction. Facial Plast Surg. 1997 Oct. 13(4):291-7. [Medline]. Bohluli B, Moharamnejad N, Bayat M. Dorsal hump surgery and lateral osteotomy. Oral Maxillofac Surg Clin North Am. 2012 Feb. 24(1):75-86. [Medline]. Gunter JP, Rohrich RJ, Adams WP. Component Osseocartilaginous Hump Reduction: A Graduated Approach to the Dorsum. Dallas Rhinoplasty. 2002. 1:471-499. Hall JA, Peters MD, Hilger PA. Modification of the Skoog dorsal reduction for preservation of the middle nasal vault. Arch Facial Plast Surg. 2004 Mar-Apr. 6(2):105-10. [Medline]. Harris MO, Baker SR. Management of the wide nasal dorsum. Arch Facial Plast Surg. 2004 Jan-Feb. 6(1):41-8. [Medline]. Johnson CM Jr, Toriumi DM. Open Structure Rhinoplasty. Philadephia: WB Saunders Co; 1990. Johnson,CM Jr, To, WC. Undefined. A Case Approach to Open Structure Rhinoplasty. 2005. Kim YD, Danchek M, Myers AK, et al. Anaesthetic modification of regional myocardial functional adjustments during myocardial ischaemia: halothane vs fentanyl. Br J Anaesth. 1992 Mar. 68(3):286-92. [Medline]. Larrabee WF. Open rhinoplasty and the upper third of the nose. Facial Plast Surg Clin North Am. 1993 Aug. 1(1):23-38. Lupo G. The history of aesthetic rhinoplasty: special emphasis on the saddle nose. Aesthetic Plast Surg. 1997 Sep-Oct. 21(5):309-27. [Medline]. McCollough EG, Maloney BP. Reduction of the nasal dorsum. Facial Plast Surg Clin North Am. 1994 Nov. 2(4):425-434. McKinney P, Johnson P, Walloch J. Anatomy of the nasal hump. Plast Reconstr Surg. 1986 Mar. 77(3):404-5. [Medline]. Murakami CS, Larrabee WF. Comparison of osteotomy techniques in the treatment of nasal fractures. Facial Plast Surg. 1992 Oct. 8(4):209-19. [Medline]. Natvig P, Sether LA, Gingrass RP, et al. Anatomical details of the osseous-cartilaginous framework of the nose. Plast Reconstr Surg. 1971 Dec. 48(6):528-32. [Medline]. Parkes ML, Kanodia R. Avulsion of the upper lateral cartilage: etiology, diagnosis, surgical anatomy and management. Laryngoscope. 1981 May. 91(5):758-64. [Medline]. Sheen JH, Sheen AP. Aesthetic Rhinoplasty. Quality Medical Publishing Inc: 1998. Skoog T. A method of hump reduction in rhinoplasty. A technique for preservation of the nasal roof. Arch Otolaryngol. 1966. 83(3):283-7. [Medline]. Straatsma BR, Straatsma CR. The anatomical relationship of the lateral nasal cartilage to the nasal bone and the cartilaginous nasal septum. Plast reconstr surg (1946). 1951 Dec. 8(6):433-55. [Medline]. Stucker FJ, Smith TE Jr. The nasal bony dorsum and cartilaginous vault. Pitfalls in management. Arch Otolaryngol. 1976 Nov. 102(11):695-8. [Medline]. Tardy ME Jr. Rhinoplasty: The Art and the Science. WB Saunders Co; 1997. Tardy ME Jr, Brown RJ. Surgical Anatomy of the Nose. Raven Press; 1990. Toriumi DM, Hecht DA. Skeletal modifications in rhinoplasty. Facial Plast Surg Clin North Am. 2000 Nov. 8(4):413-432. Vermeiren J, De Vos G. The feather touch rasp, a powered instrument for hump reduction. B-ENT. 2007. 3(3):113-7. [Medline]. Webster RC, Davidson TM, Smith RC. Curved lateral osteotomy for airway protection in rhinoplasty. Arch Otolaryngol. 1977 Aug. 103(8):454-8. [Medline]. Wright WK. Lateral osteotomy in rhinoplasty. Further considerations. Arch Otolaryngol. 1963 Nov. 78:680-5. [Medline]. After resection of the dorsal hump, osteotomies are required to close the open roof and reestablish the nasal pyramid.